No. 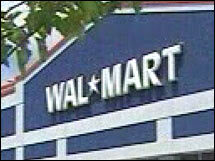 1 retailer will only press charges if shoplifters take at least $25, in change to zero-tolerance policy. NEW YORK (CNNMoney.com) -- Wal-Mart is moving away from what it called a zero-tolerance policy on prosecuting shoplifters and will now only prosecute anyone caught taking merchandise worth $25 or more, according to a published report. The New York Times reports the change in policy, citing internal documents from Wal-Mart that say it will now only press charges against those between the ages of 18 and 64 who take at least $25 worth of goods. Formerly its policy was to press charges against anyone who took at least $3 in goods. Wal-Mart is reportedly changing its zero-tolerance policy on shoplifters. The paper said the change in policy will allow Wal-Mart to concentrate on theft by professional shoplifters and its own employees. The paper said those two groups steal the bulk of merchandise from the chain. "If I have somebody being paid $12 an hour processing a $5 theft, I have just lost money," J. P. Suarez, who is in charge of asset protection at Wal-Mart, told the paper. "I have also lost the time to catch somebody stealing $100 or an organized group stealing $3,000." Wal-Mart told the paper it would closely track shoplifters it did not have arrested, and would ask that they be prosecuted after a second incident. It will also seek the prosecution of all suspected shoplifters who threaten violence or fail to produce identification, no matter how much they are trying to steal, according to the report, which said professional shoplifters often do not carry ID in order to avoid arrest. The change will also put the company's policy in line with most of its major competitors. The paper said that the change also will answer complaints of small-town police departments across the country who have protested the previous zero-tolerance policy. At some stores police were making up to six arrests a day, according to the report, which said some departments had to hire extra officers just to handle the Wal-Mart arrests. The paper said it was given the documents detailing the new policy by WakeUpWalMart.com, an anti-Wal-Mart group that told the paper it received the documents from a former employee at the chain who is unhappy with the new policy. Related: Wal-Mart fights to keep the smiley face.